The Michael Hammer Society of Fellows is a distinguished, on-campus fellowship program that identifies, recruits and supports the most talented students and postdoctoral researchers addressing significant societal challenges at an early stage of their careers. IDSS Hammer Fellows are drawn from the IDSS postdoctoral fellows and students in the doctoral program in Social & Engineering Systems. Founded in 2017, this initiative is made possible by a generous gift from Phyllis Thurm Hammer in memory of her late husband Michael Hammer ’68, SM ’70, PhD ’73. Michael Hammer was a visionary engineer, business leader, author, and MIT professor who made a remarkable impact on both MIT and the nation’s engineering and business landscape. He recognized that solving major societal challenges begins with an understanding of how complex systems function and interact, requiring a careful analysis of inherently different kinds of systems: physical and engineered, economic and social behavioral, and institutional. 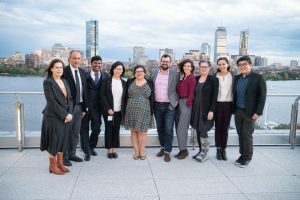 Hammer Fellows embody that ingenuity, and will carry on his legacy through their innovative research far beyond their time at MIT. Upon completion of their doctoral program or postdoctoral research, IDSS Hammer Fellows are invited to join a society of academics and professionals dedicated to excellence in social and engineering systems. Once a Hammer Fellow, Always a Hammer Fellow. Hammer Fellowships are awarded annually by an interdisciplinary faculty committee. Doctoral students in IDSS, with a preference for SES students, and IDSS postdoctoral researchers are eligible. Selection is made on the basis of outstanding qualifications. For PhD students: Selection is made on the basis of outstanding qualifications, with a preference for incoming doctoral students. Nominees will be made from the Social & Engineering Systems Doctoral Program. In addition, IDSS faculty members and PIs may nominate students. The MIT IDSS Hammer Fellows Program Chair is appointed by the director of IDSS for a three-year (renewable) term.